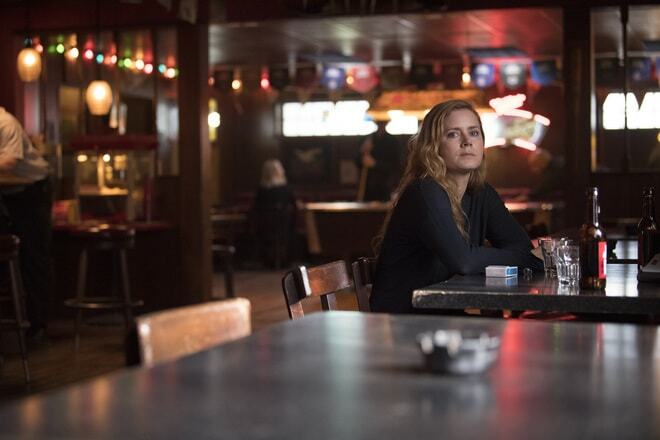 Sharp Objects episode 2: 'Dirt' review: Filth and gossip as things get more uncomfortable – AiPT! Sharp Objects continues, along with a bonus rant about AT&T and HBO. Warning! Spoilers for ‘Sharp Objects’ ahead! The premiere of Sharp Objects took its time to introduce its characters, setting and mystery. It was filled with great performances, anxiety inducing, and an overall strong debut. Could the second episode keep up? The story so far: Reporter Camille Preaker reluctantly returns to her hometown of Wind Gap, Missouri to investigate the deaths of two young girls. It becomes apparent that the people of the town are guarded and do not care for out-of-towners, which they now consider Camille to be. Her image-obsessed mother, Adora, strongly objects to her daughter’s reasons for returning to Wind Gap while Camille struggles with her own demons. ‘Dirt’ continues the meticulous pace of the first episode. The town and its inhabitants are somehow given more depth as town myths are introduced and there is a closer examination of how gossip travels. A gathering attended by much of Wind Gap and shows the pettiness of its people. The class divide is expertly shown once again. The oppressive feeling of the first episode is heightened here. Every member of the cast seems to be covered in a sticky sweat and the viewer can almost see the humidity. Each setting seems bogged down by heavy air that slows everyone down as they try to move, giving a suspicious quality to the entire show. Watching Sharp Objects is a tension filled undertaking. Camille’s flashbacks continue to haunt her and are disgusting and chilling. The longer she stays in the town she grew up in, the more clear it becomes that Camille left due to a horrible incident. While it still is not obvious what has happened, it definitely has scarred her in many ways. While present day Wind Gap is surrounded by an uncomfortable atmosphere, Camille’s past appears it may have been worse. The strong acting in Sharp Objects continues in the second episode. Once again, Amy Adams and Patricia Clarkson are splendid in their roles as mother and daughter. Adora really has a chance to shine as many crucial scenes involve her. More insight is given into her character and the relationship between Camille becomes more interesting with each second they spend on screen together. The second episode of Sharp Objects is another strong entry. ‘Dirt’ expands upon many of the themes introduced in the premier. The deep story is filled with rich characters and an engaging, if disturbing, mystery. Bonus Rant: Earlier this week, AiPT! editor-in-chief Patrick Ross reported the news that HBO’s new parent company AT&T has some ideas for some drastic changes for the critically acclaimed network. I will not go into the finer details since Patrick already did an excellent job of that. However, I did want to add my two cents. I do not watch television often. Whenever I start something, I will usually watch an episode or two before just stopping. Though it is not completely immune to my flighty viewing habits, HBO is the only channel that has been able to consistently put on shows that keep my attention in recent years. It is depressing that in 2018 making a profit while still having high standards for quality is not considered good enough. Just another case of why we can’t have nice things. Sharp Objects continues to impress with a strong second episode. Uncomfortable and engaging at the same time, this fits perfectly in HBO's pantheon.